For this work, Louise Lawler sounded out the names of various well-known male artists—including Vito Acconci, Carl Andre, and Donald Judd—in the style of birdcalls. 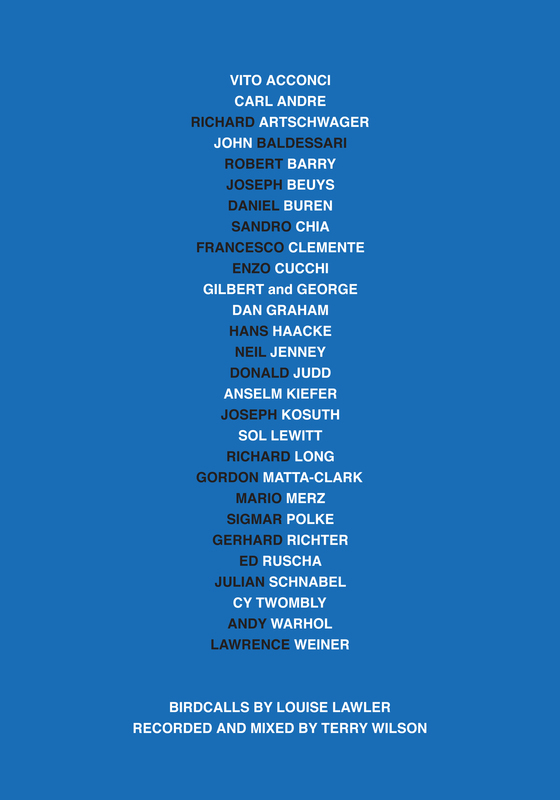 The humor and wit are balanced by the knowledge that these white male artists are continually recognized as being at the forefront of art, its discourses, and its histories, with no symmetrical attention paid to the significant contributions of women artists and artists of color in the discussion of advanced aesthetics. Listen to Birdcalls on Ubuweb. "Birdcalls." Take It or Leave It: Institution, Image, Ideology Digital Archive. Los Angeles: Hammer Museum, 2017. https://​hammer.ucla.edu/​take-it-or-leave-it/​art/​birdcalls/​.